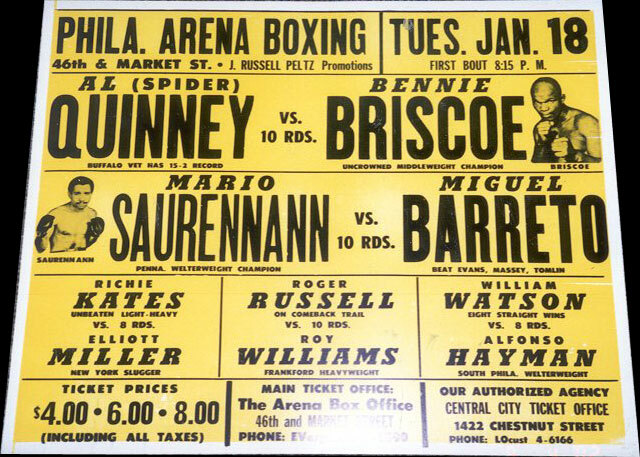 Number One middleweight contender Bennie Briscoe opened 1972 with a TKO victory over Buffalo's Al Quinney on this date before 3,323 Philadelphia Arena fans. The fireworks started almost immediately as Briscoe blasted his spidery 6' 1" foe with his usual right and left-hand bombs, scoring a knockdown toward the end of the first round. But that was just the warm-up. In round two, Briscoe whacked away at Quinney, putting him down three times in 1:45 for the automatic stoppage. It was Briscoe's 10th KO in a row. The win lifted Bennie's record to 41-9-1-1 NC (34 KO) and pointed him back toward old rival Carlos Monzon, by then the middleweight king. Briscoe's prior draw with a pre-champion Monzon was disputed by many who felt Bennie should have gotten the decision. Thus a rematch was a natural and was hotly anticipated by boxing fans. However, steering Monzon back into the ring with the ever-tough Briscoe would prove to be a challenge. None the less, it would happen by the end of the year.